The proposed plastic ban and the country's commitment to the Paris’s Climate Change Agreement will not be successful and realized unless serious steps are taken to develop a culture of respect, valuing and honoring the natural environment in a serious and tangle way. While welcoming the government decision to ban plastic bags, bottles and wrapping as a good start that was long over due, he challenged Minister John Pundari and the government to protect, preserve and conserve the environment and use it in a sustainable way starting with the declaration of 5th June as a national day for the environment. Governor Parkop repeated his call for Government to declare it as a National Day of Action to protect, conserve and clean the environment for the country to stop dumping mine tailing in the river system and the sea, and to do more on reforestation by replacing every tree being cut! “These actions are not just important to honour our international obligations and offer more to protect the environment but more importantly it will develop in us-as a people and a nation-a culture of respect and appreciation for the environment and its critical role to our survival. We had such culture before but we have lost it and instead valuing more the economic gains over the environment,” a concerned Parkop said. Governor Parkop emphasized that his call to declare the 5th of June as a national day of action is to enable the people to start developing these values in them as without respect and appreciating the importance of the natural environment, all country's effort-including plastic ban-would fail. “We need to show we are serious. We also need to show we respect our environment. We need to show we honour our environment which we have inherited from our ancestors. When we make such commitment in serious way than our people will start to shift in their behavior and take action themselves to protect the environment including choosing not to use plastic bags,” he said. 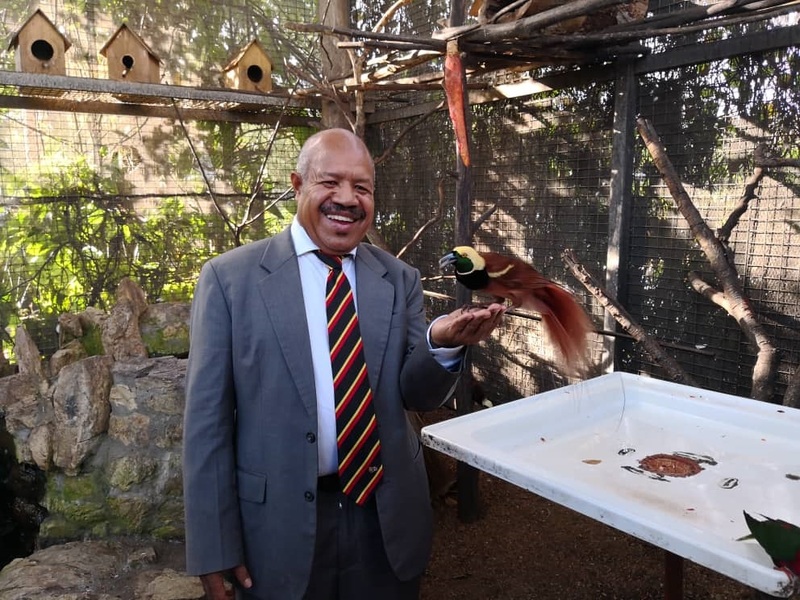 Govenror Parkop explained that problems which are being faced in cities like Port Moresby is partly a result of 'our failure to develop or maintain a culture of respect and honour for our natural environment'. ”People spit and litter everywhere in Port Moresby because we have lost the culture of respecting and honoring our environment which our ancestors used to have. We need to restore that to make the stop plastic pollution a success and also stop the littering and spitting of our cities and towns," he said. Drawing his experience from the Buai Ban, Mr Parkop asserted that without behavior and attitude change, the ban on plastic will not work. "Banning alone will not balance the equation and the dynamics on the ground. People will find excuse or find ways to defeat the ban because they don’t take the goals of the ban seriously just like they have shown with buai ban," said Mr Parkop. “Our people are succumbing to poor habits of no-respect for environment and being irresponsible because we have not maintained high environmental care standard. That’s why having a day of National Day of Action every year on the 5th of June is important and critical to shifting our people’s behaviors and attitude,” he uttered. Mr Parkop wants the government to take the lead in seriously considering environmentally-friendly initiatives to clean and protect the environment, proposing dams for present and future mines to hold mine tailings and undertake reforestation in areas where trees have been harvested. Governor Parkop welcomed the assurance from the Minister for Environment, Conservation and climate Change, Hon. John Pundari who said he was pushing for seeking Cabinet’s endorsement to declare June 05 World Environment Day as a Public Holiday. Speaking at the launch, Mr Pundari agreed that behavioural change will play a significant role in protecting and cleaning the Environment, saying without which all efforts will be undertaken to no avail as it has been the case when similar bans were introduced. Minister Pundari said if all turned out his way, World Environment Day next year will see the country starts observing it as a public holiday, a national day to take action. “The holiday, when endorsed, is not for us to enjoy and roam around in Port Moresby or not to clean the dirty streets of Port Moresby. We must develop culture and value system to take our environment seriously that we are going to take action and honour it as it has been passed on to us by our ancestors from generations immemorial. “I am not calling for us to do it for the whole world but importantly for us so that our children here can turn around and respect the environment by way of replanting trees, stop littering, stop using plastics, not chewing betal nut and spit here and there. “Thus, we can instil sense of respect and responsibility in them to take ownership of our city and the country, and save a better future and the many generations to come. I want the government to lead the way to develop this good positive system that we try to appreciate and build this life. Money, gold, oil and gas will be depleted. With environment, we will still survive as our ancestors,” he said. Picture courtesy of Jamie Pang who took this shot whilst governor Parkop was visiting the the bird of paradise sanctuary of the Sanctuary Hotel and SPA at North Waigani in Port Moresby today.